Water flow sensor consists of magnetic core, rotating impeller, external casing and sensor and a hall-effect sensor. When water flows through the rotor, rotor rolls, it activates the magnetic core to trigger switch action speed changes with different rate of flow. The hall-effect sensor outputs the corresponding pulse signals, users can get the flow speed via detecting the pulse. It is suitable to detect flow in water dispenser or coffee machine. 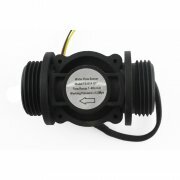 There are also lots of other water flow sensors in other diameters for your choice.